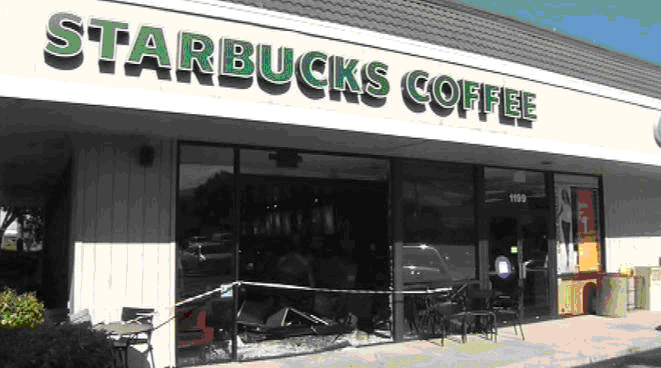 When Storefront Safety Council co-founder Rob Reiter did a scan of storefront crashes over the last year (identified via online media accounts), he discovered that Starbucks consistently had the second or third highest number of crashes in the US—trading places with 7-Eleven here and there for the number two and number three spot. (Who was number one? Read to the end for that tidbit!) Here’s a Q&A with Rob on what he found (all Starbucks images sourced from Rob). Rob: Starbucks recently had four accidents in four weeks around the US. I believe there were more incidents than these four, since we’re only capturing these through online media searches. Also, companies with the largest number of storefronts would be expected to have the largest number of incidents, just as a reflection of the greater number of locations and the greater number of times per day that cars drive into their parking lots and pull into their parking spaces. Mark: Let’s just look at these four. What can you tell us about them? Rob: In June, there were crashes in Sheridan, Wyoming, and Milpitas, California; and so far in July there were crashes in Neenah, Wisconsin, and Havertown, Pennsylvania. Two of these crashes resulted in injuries, and all of them were documented in press reports with photos of the scene and damage. Mark: What happened at each location? Rob: One was the result of a drunk driver, one was the result of a medical episode, and two were the result of pedal error by the driver. 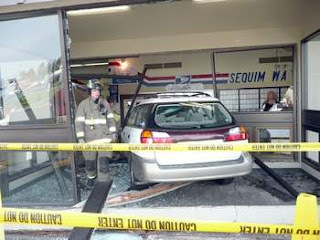 In three of these crashes, vehicles were pointed right at the building while they were parking, with no barrier between the parking spaces and the storefront. All of them impacted the building at or near a point where people would be entering or leaving the store, or standing or sitting enjoying their coffee or tea. Mark: I remember you contacted the Starbucks media department to get their comment or see if they would connect you with someone for an interview. What was their response? Mark: Did Starbucks respond when you reached out that time? Rob: Yes, with an email that said “timing and availability” prevented them from being able to provide me with an interview. The email did include a statement they said I could attribute to a Starbucks spokesperson. Mark: What did that statement say? Mark: Interesting. Do you agree that these incidents are “rare” from what you’ve seen? Rob: At each location, yes. But taken as a whole, a company with that many locations around the US is likely experiencing these accidents on an almost daily or at least weekly basis somewhere in the country, based on crash patterns I’ve seen for retail businesses with similarly high numbers of locations, like Dunkin Donuts and 7-Eleven. That doesn’t add up to be “rare” in my book. 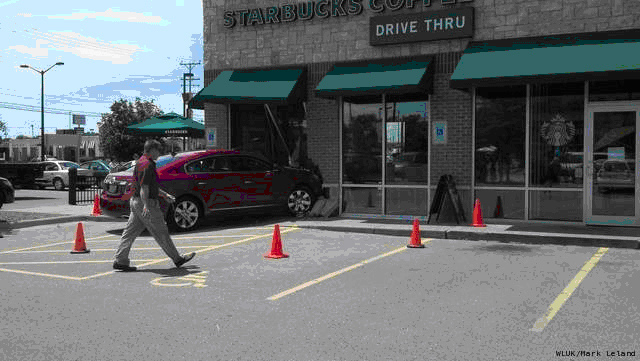 Witness the four latest Starbucks crashes in four weeks I just listed. Mark: And the second contact with Starbucks? 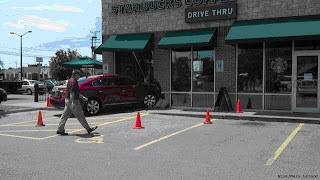 Rob: After the Milpitas crash, a Starbucks regional manager told KGO-TV that this was the fourth car to crash into one of the stores in Milpitas and Fremont in the past three years. When I contacted Starbucks following that media account, and again requested an interview, I got a brief apologetically-phrased reply thanking me for “reaching out to the Starbucks press line” and saying, as before, time and availability prevented an interview. Mark: It’s unfortunate, but not surprising. I’ve noticed even companies that typically do use bollards or other barriers to protect people have been extremely reluctant to talk about this subject. One of our Storefront Safety Council colleagues suggested to me that this reticence is probably due to liability concerns, as well as fear that a plaintiff’s lawyer might twist their words or actions in court. Rob: Having been an expert witness in a number of trials, I know the stakes are high for companies. But the stakes are even higher for people — be they customers, employees, or bystanders — who get injured, or worse, in these crashes. 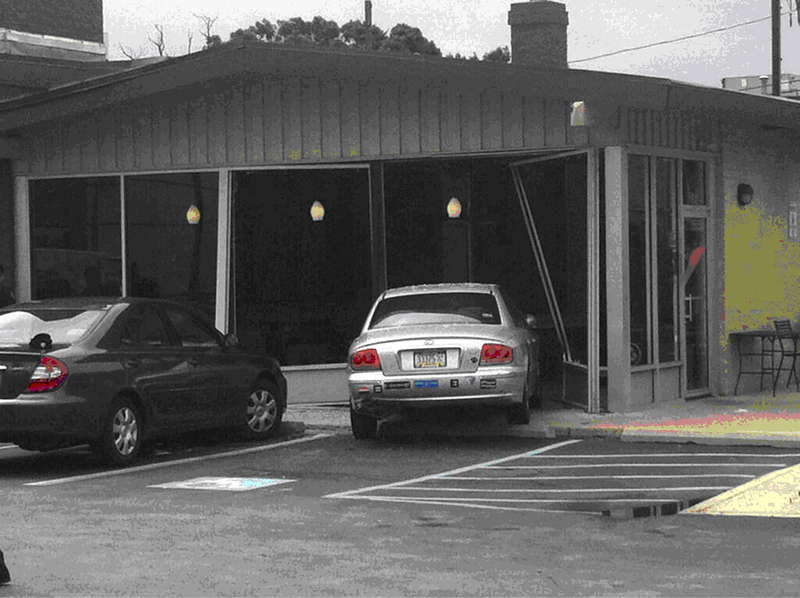 Plus, the property damage and lost business experienced by a company means that company was a victim, too. 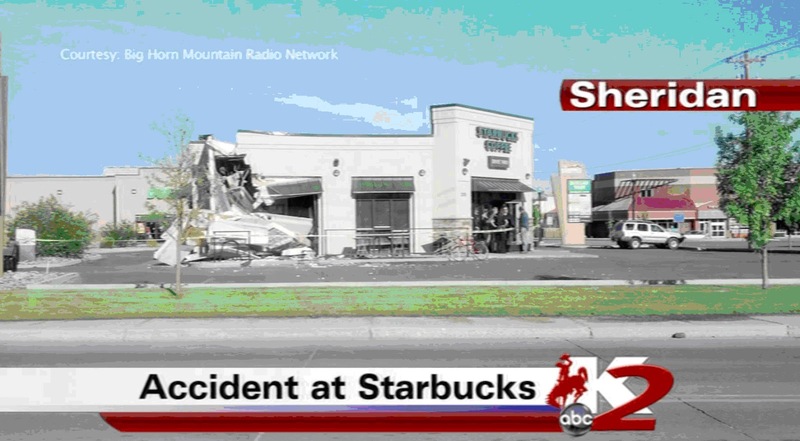 Mark: So you have some sympathy for Starbucks and other storefront businesses? Rob: Sure. I don’t think they’re deliberately trying to get hit. They’re in business to offer a great product, and I suspect that — to the extent they even have any internal awareness of this problem — they probably just wish it would go away. Mark: Wishing isn’t working. What do you think it will take to educate companies about the need to be proactive? Rob: More work. More documentation. ASTM is putting the finishing touches on a testing standard for all types of barriers that have application for retail locations, pedestrian areas, and the like. That will lead to standards that architects and engineers and lawyers can look to when they are developing or upgrading properties, and could lead to local codes and ordinances that will require protection for pedestrians, patrons, and store workers. Mark: So, you said Starbucks and 7-Eleven had the second-to-third highest number of crashes in the past year from your review of media accounts. Who was number one? Rob: That distinction belongs to the US Postal Service. Mark: Wow, interesting. Any contacts with them yet? Editorial Note: Be part of the discussion via the Storefront Safety Council LinkedIn group.